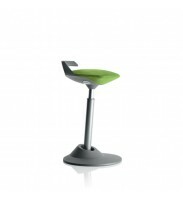 The muvman is simply variable standing or sitting in motion. It's quite logical really, that hours of sitting can make you tired and ill, and this makes practically everybody's back ache. Alternatively, standing all day is not really ideal either. The muvman is simply variable standing or sitting in motion. It's quite logical really, that hours of sitting can make you tired and ill, and this makes practically everybody's back ache. Alternatively, standing all day is not really ideal either. It's much better that you put movement and change into sitting. And this is exactly what the muvman variable seating provides. Unconventional..